September, 2008: This week my kids and I are “binge reading” a number of devotionals from a collection by A. W. Tozer, one of the pioneers in the Christian & Missionary Alliance denomination. His final pastorate was at the Avenue Road* Church in Toronto, Canada, which continues to this day as Bayview Glen Alliance. Tozer is one of a number of classic reads, in a list that includes D. L. Moody, George Whitfield, Watchman Nee, Jonathan Edwards, E. M. Bounds and others. What is it that’s different about reading classic authors like these? Language – Right away you notice that they speak with a different voice, and having studied the Philosophy of Language, I know that our use of words shapes our understanding. There is also a greater economy of words on some points, but there is laborious repetition on others, so that we don’t miss something profound. Clearly, the did understand some concepts somewhat differently than many of do today; and the “spin” on some Bible passages is distinctive by our standards. Intensity – These classic writers endure because they were passionate about living the Christian life to the nth degree. There is an urgency about their writings that is sorely lacking in some modern Christian literature. Were they preaching to the choir, or were they voices crying in the wilderness? Probably both, and with the same message for both. Response – They wrote in response to the issues of their day, some of which are unknown to us now, but some of which are strikingly similar to the issues of our day. There was a concern for a general apostasy, a watering-down of the gospel and of Christian ethics. Is this just preacher rhetoric, or are things truly deteriorating with each successive generation? Or do Bible teachers and preachers just get so “set apart” that they start to view both the church and the world less charitably? Wisdom – These books represent the cultivation of much wisdom in an era that wasn’t full of the distractions of our era. While we will inevitably turn back to our modern writers; there is much to be gained from seeing how scripture was interpreted in a previous century. They did their homework so to speak, and interacted with others who were on the same path of study; and some of them were simply a few hundred years “closer to the story” than we are today. What classic authors do you enjoy? I remember cringing the first time I saw the course offered at my ‘secular’ university: The Bible as Literature. This was a book which had changed my life and which was so highly treasured among the people of my faith tribe, that to reduce it to simply ‘literature’ seemed disgraceful. Part of this was the context; after all, what could this godless college possibly have to offer that would affirm the tenets of my Evangelical upbringing? In some ways, today I still see the Bible as so much more and yet I am also now a strong advocate for the one story type of approach to sacred scripture, impressing on any and all who will listen the idea of a single overarching story. I’m also increasingly convinced that the ways and purposes of God have been revealed through narrative. This is, after all, the way our children learn the first principles of our faith system, through Adam, Noah, Abraham, David, Daniel, Jonah, Jesus, Peter and Paul. Last week a long-time acquaintance loaned me a copy of a 1984 book she had just purchased: Texts of Terror: Literary-Feminist Readings of Biblical Narrative by Phyllis Trible (Fortress Press). The four stories are truly among the most horrific the Old Testament has to offer: Hagar, Tamar, Jephthah’s daughter, and the unnamed mistress in what is probably the worst of them all, the story commencing in Judges 19. Why are these stories even in the Bible? It’s a fair question, and it doesn’t diminish my respect if you feel like asking it. I was also a little nervous about the idea of this being a particularly “feminist” reading of the text, but it didn’t really play out that way. True, it’s centered on female characters and would fit well into a Women’s Studies core curriculum, but I think the commentary was fair and balanced, and certainly delved into a lot more detail on these particular stories than you might find in a broader commentary title on Genesis, 2 Samuel or Judges. But the reading the Bible through the lens of literary criticism is both fascinating and disturbing at the same time. The reference to “chiasmus” (I know these as chiasms) which are stories containing a built-in symmetry (often following the form, A, B, C, D, C’, B’, A’ or something similar*) was interesting but I don’t know that every story has to have this feature. I can see how it makes for great literature but again, I think you’re forcing the literary agenda on texts that, as beautiful as they are, weren’t written to win a prize for non-fiction. To that end, the author had a penchant for invoking Messianic phrases from Isaiah. Some of them were obvious I suppose, you could see them coming, but I’m not sure how this advances understanding of these texts. I just didn’t see the typology; placing these women as types of Christ, though there were some similarities in the storyline. The payoff on some of those comparisons really was found in the word-study application to similar uses of the same Hebrew word in passages with which we are familiar. I did love the contrast between the text in Judges, “Every man did what was right in his own eyes” to the author’s commentary that while that may have been the case when “there was no King in Israel,” when there was a king, “Royalty did the right in its own yes.” Good observation. There was another section — one the person who loaned me the book didn’t underline — I meant to come back to, but now I can’t find it. Texts of Terror is a 1984 print-on-demand paperback ($20 US, 128 pages) with a forward by Walter Brueggemann, that is part of the Overtures to Biblical Theology series. I just finished reading what is for me, the second book in a series I hope to complete over the rest of the year. 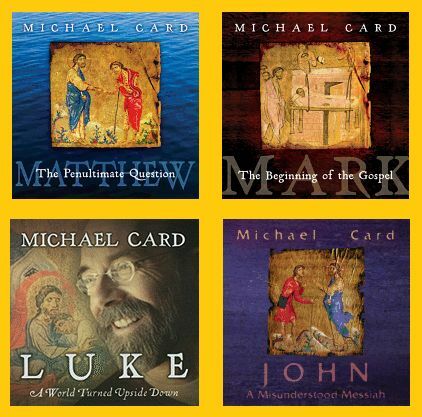 Luke: The Gospel of Amazement by Michael Card is part of the Biblical Imagination series. Since I’ve already devoted some space to it after I read and reviewed Mark: The Gospel of Passion — click here to read — I won’t go into great detail, since the format of all four books in the series is the same. In this volume, Card points out certain recurring themes in Luke that aren’t present (or as noticeable) in the other gospels including the attention to detail and the observations on the role of women in the narrative, and we also come to understand how it is that Luke got the information that is unique to his story. I wasn’t really taking notes on this one, but one takeaway — which applies to the whole series — is that the speculative, imagination-based things Card points out are not things being extrapolated without other Biblical support, but rather, the text bids us or begs us to make certain connections. Honestly, completing the book only makes me want to read more Luke commentaries. There is so much going on in these gospels that we miss completely. To my friends at InterVarsity / IVP Books in Illinois: I had to buy this one. Next one is your turn, okay? If you know anyone who is responsible for teaching the Bible in Children’s ministry, youth ministry, small group leadership; or someone who is simply wanting to get it right when it comes to their parenting responsibility in leading their family in their daily devotions, The Bible Story Handbook: A Resource for Teaching 175 Stories from the Bible by John Walton (Crossway) is an essential resource. John Walton, professor at Wheaton College and his wife Kim Walton, a longtime curriculum user, developer and evaluator work through 97 Old Testament narrative stories and 77 New Testament stories in light of: Lesson focus, Lesson application, Biblical context, interpretive issues, background information and mistakes to avoid. It is the final section for each entry — mistakes to avoid — that is where this book shines. Too many times we’ve been subject to teaching which put the emphasis in the wrong place, missed the greater context, or simply went off down the rabbit trails of story details. Often these misguided teaching foci proliferate or are passed on from church to church or generation to generation. This is a book to keep on your shelf as needs arise. It deals exclusively with narrative passages; for example, in the New Testament, there are no entries after the book of Acts except for the lone one that covers all of Revelation. Because it’s a Bible reference product, you might not read it sequentially, although you certain could take that approach. But as a reference tool, I didn’t attempt to read it all; the copy I have is actually on loan; and the publisher is one whose products are not likely to cross my desk. The Bible Story Handbook was published in 2010 and retails in paperback for $24.99 U.S. It’s a great gift for a Sunday School teacher, youth pastor, or anyone with love for teaching the Bible to kids, teens or adults. When you think of all the medical advances of the past few decades, and then read the gospels and consider that Luke was a doctor, you have to ask a couple of questions. First of all, what did he know? In other words, since he didn’t have the information that modern science now has available, how did he go about treating people? The second question would be: Is there any information that he had which has gotten lost over time? In other words, did he know things about what we, in our sophistication, would call “alternative medicine” — things about roots and berries etc. — including knowledge we’ve misplaced? And then I think about spiritual knowledge. I love today’s modern Christian writers. In 2009 and 2010 I finished reading more Christian books than at any previous time in my life. (Though there’s been a bit of a slowdown recently that I partly attribute to a shortage of titles that intrigue me.) As the (capital C) Church, we need new writers who will teach the scriptures to our own generation. But then I start working my way through Christian classics, and I keep feeling that, like Luke’s medical knowledge, perhaps certain things are getting lost. Maybe you’ve had this experience. Where is The Message version of some of these classics? The late Keith Green did a few updates in his newsletters, and you probably have a copy of James Reimann’s update of Oswald Chambers’ My Utmost for His Highest on a shelf. But lately — he said, creating yet another paragraph, something older writers would never do — I’ve been reading the lessons in Andrew Murray’s With Christ in the School of Prayer and wondering how they would look with a Eugene Peterson treatment. April 1 — Joanna, A Disciple of Jesus — In a 2005 piece, Jeff Lucas looks at this disciple mentioned twice briefly in the NT. April 2 — The Discipline of Walking in the Spirit — Paul Steele unpacks a phrase that we might toss around without considering its meaning. April 3 — Jesus’ Attitude Toward the Divorced — Kevin Rogers notes that in even talking to the woman at the well in John 4, Jesus was somewhat identifying with her situation. April 5 — When You Converse with Jesus — Jon Swanson avoids the formulaic approach to Christian living, but suggests it’s more like an ongoing conversation, and notes some things you can expect to happen as you talk. March 27th — Pastors, Tell us the Truth — Rachel Held Evans encourages pastors when they’re wrestling with theological issues, or are just plain burned out. March 26th — Most Mis-Applied Bible Verse — Chris Brauns suggests that the verse, “Where there is no vision, the people perish;” isn’t about your church having a mission statement in the weekly bulletin. …If you’ve seen paraphrased sections from classic writers such as Andrew Murray let us know where the treasure is buried. Better yet, write one of your own. It’s informative to slow down and ask yourself: What is this writer truly saying, and how might I say that today?